Ngawi village on the Palliser Bay coast near Cape Palliser. Known for the fishing fleet of small boats hauled up on the beach by bulldozers. 8.30am - 9.30am	Registration, sign on, team managers to collect race packs. 9.00am	Team managers meeting with Race Director and Chief Comm. 9.55am	All riders must be at the start line. 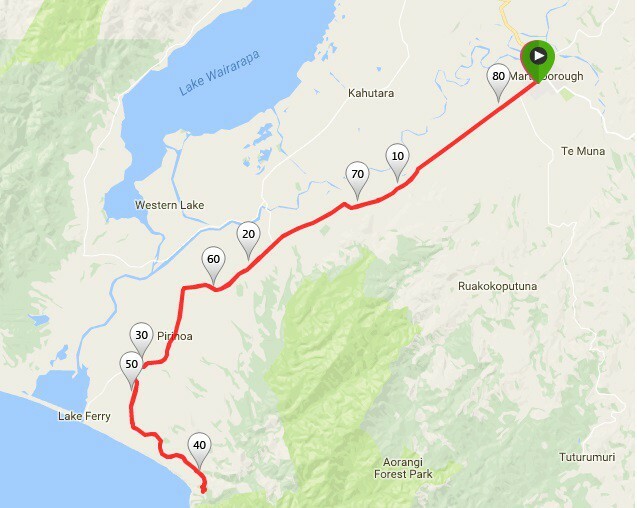 Riders start from Martinborought heading south towards Lake Ferry via Jellicoe St and Lake Ferry Road. 41km - U Turn, return to the finish.